Assessing stakeholders according to their source and strength of legitimacy, as well as according to their level of activity. What questions could be asked when interviewing stakeholders in the process of developing a stakeholder involvement strategy? What key aspects should a stakeholder involvement strategy embrace in the different stages of the MSP process? The Swedish Maritime Agency for Marine and Water Management, the central authority responsible for MSP in Sweden, commissioned this study in the Swedish MSP process. It was developed as part of the PartiSEApate project. Based on interview guidelines (tailored to specific stakeholder groups, i.e. County Administrative Boards, regional authorities, local authorities, research as well as trade associations and NGOs), telephone interviews were conducted with a number of stakeholders lasting on average 30 minutes to one hour. The guideline included questions on the perceived role of the respondents’ organisations in the different steps of the MSP process and on expectations on how the planning process should be organised. Thereby, information could be gained on when stakeholders want to be involved. Furthermore, questions were asked on cooperation and interaction partners, which helped to complement the preliminary list of stakeholders to be involved. In general, the interviews fostered an understanding on the level of information and attitude of stakeholders on MSP overall. 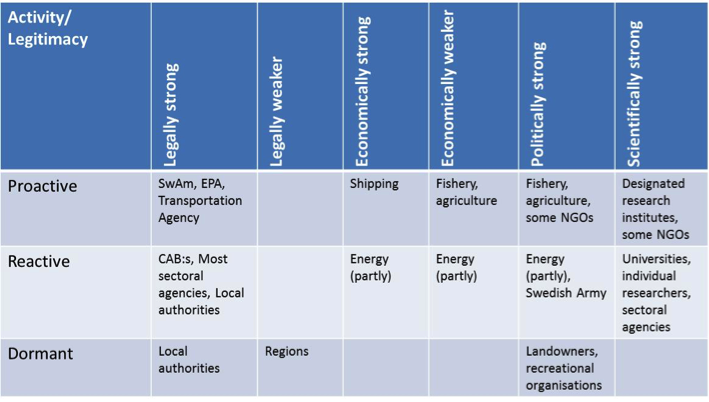 The accompanying matrix shows stakeholders’ degree of legitimacy with regard to MSP as well as their prevailing level of activity. This matrix serves as an overview on stakeholders to involve. It can be taken as a starting point to develop targeted involvement strategies. Stakeholders who derive their prime legitimacy from economic powers and interests. Furthermore, the degree of legitimacy (strong/weaker) was specified, if applicable. Apart from that, the information gained through the interview process helped to determine key aspects of a Swedish stakeholder involvement strategy throughout the planning process. 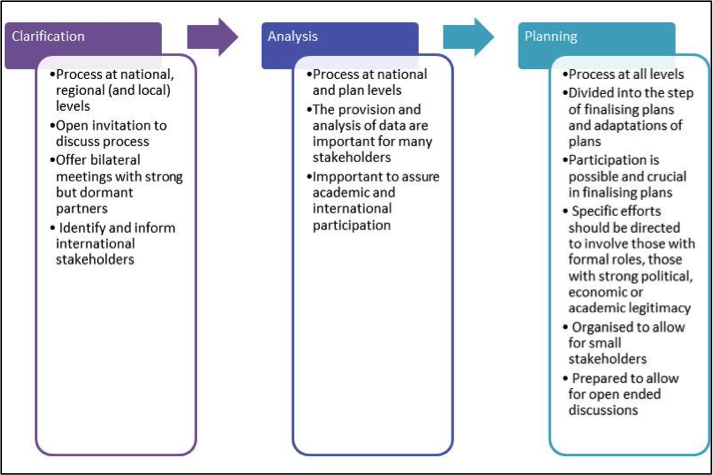 The method applied, especially the typology / categories used to differentiate between stakeholders can easily be transferred to other countries / MSP processes. The findings from the Swedish Stakeholder Analysis may already provide a good indication for similar “typologies” in other countries. Some elements of the resulting stakeholder involvement strategy (i.e. the levels of the stakeholder involvement processes) are specific to the Swedish case. However, the list can be amended/complemented to fit other MSP cases, too.